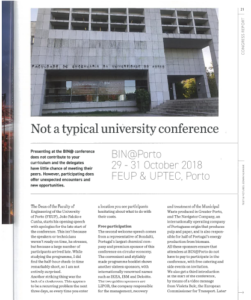 BIN@PORTO 2018 took place at the Faculty of Engineering of the University of Porto (FEUP) and at the Science and Technology Park of University of Porto (UPTEC) during 29 – 31 October 2018. Event’s official website: BIN@PORTO 2018. BIN@PORTO 2018 was a highly motivating experience and included various activities like Open Sessions, Action Tanks, Debates, 3-day Co-Creation Workshop on Challenges for Design towards Sustainable Development Goals (2030 Agenda), and the Technology Showroom & Business Showcase exhibition – all governed by the umbrella themes of Open Innovation and Circular Economy. All these activities were varying and different enough to let the participants choose exactly these topics and sessions which were of special interest to them. 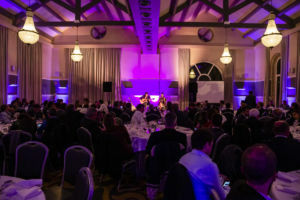 As a cherry on top, the event also included a surprising and enriching social programme, striking a perfect balance between work and pleasure. 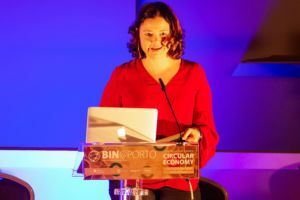 One of the main highlights of the event was the handing over of the “BIN@ Champion of the Year Award” to Ms Clara Gonçalves, the Executive Director of UPTEC, for her notable contribution to the development of the network and to the organisation of the annual event in Porto. 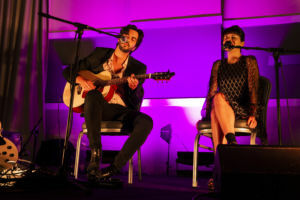 The prize was handed over during the Gala Dinner, held in the evening of event’s second day, 30 October, at the exquisite Pestana Palácio do Freixo, where the festive, yet refined, mood of the guests was even more augmented by the performance musical group “Best Youth”. 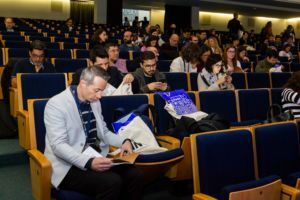 Down below are available the transcripts of the speeches given by Pedro Coelho (Coordinator or BIN@PORTO 2018) and Júlio Martins (CEO of IDEIA.M) which introduced the prize – for what it stands for and its main characteristics. 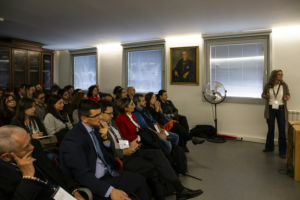 Yet above all, the speeches focused on the reasons what brought the distinction exactly to Ms Conçalves. The assignment of the BIN@ Champion of the Year Award is a way to honour someone’s continuous support and commitment to our network. The person awarded this year is the personification of a community builder, always working generously to nurture enduring relationships. This person is a cornerstone of our community. 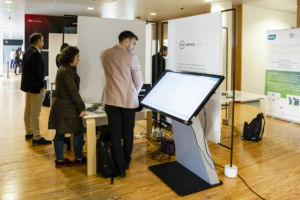 This year, we challenged our partners from ideia.m to create, design and produce a unique peace of art with a lot of meaning. We would like to thank João and Júlio for accepting the challenge and thank their generosity in offering it free of charge. We would like to invite Júlio to come to say a few words about the ideation process and to announce the name of the awarded person. We came up with a pillar. A representation of the ones holding both small and huge buildings. The Champion of the Year 2018 is, indeed, part of the foundations of a very relevant construction and organization where bigger structures flourish and arise. We came up with a concrete pillar. Concrete offers robustness and a solid and long lasting life. The Champion of the Year 2018 is, indeed, an important part of the strength and the past, present and future of the institution. Even though, concrete may start showing up some problems, like cracks, and some foundational challenges may arise. So we came up with the use of a Japanese ancestral technique called Kintsugi ou Kintsukuroi that, as a philosophy, it treats ceramics breakage and repair as part of the history of an object. The repaired joint uses gold powder, adding value, beauty and rarity to its existence, while highlighting that adversities are a gift for us to learn, grow and improve. The Champion of the Year 2018, indeed, in a continuous effort, enthusiasm and passion, turns hurdles into highways, converts difficulties in opportunities and struggles every day for everyone’s success. What I just said about constructions and challenges may arise in businesses, innovation, networks, startups, companies, universities or even municipalities, and the Champion of the Year 2018 personifies this meaning, this context and, hence, deserves this recognition. That’s why this is the trophy and this personality is the Champion of the Year 2018. 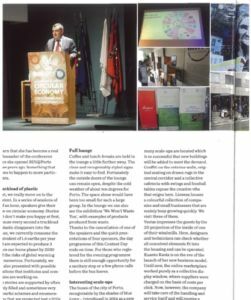 Noteworthy is also the witty & well summarising reportage about BIN@PORTO 2018 made by the Dutch-based magazine “Conference Matters” in which the author of the article, Edwin Nunnink, found the event to be “not a typical university conference” and the latter in its most positive meaning. 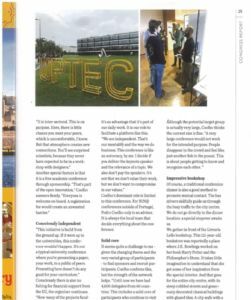 The article is available both in print as well as online version (see the online version here). 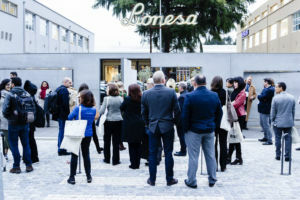 A conference from a university that cherishes open innovation in a beautiful, yet highly distinctive, city. Let’s be honest. Isn’t that a far more intense experience than yet another trip or even a first trip to London, Paris, Amsterdam, Vienna or Berlin?